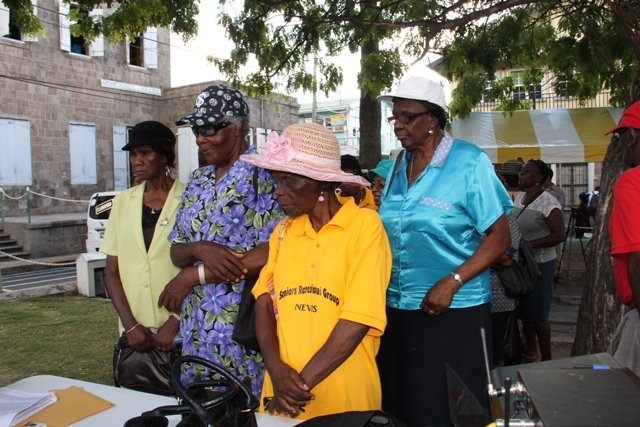 NIA CHARLESTOWN NEVIS (OCTOBER 02, 2015) — The observance of International Day of Older Persons on Nevis, marked a happy moment for 52 of the island’s seniors, when Junior Minister in the Ministry of Social Development Hon. 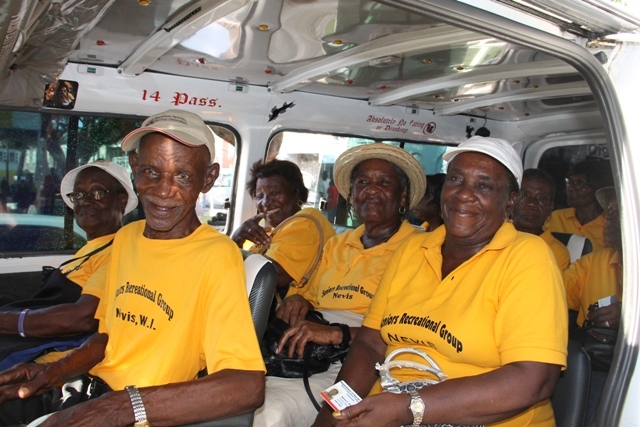 Hazel Brandy-Williams launched the Seniors Subsidized Transportation Programme. So far 150 seniors signed up for the Programme. In remarks at the ceremony on October 01, 2015, at the Memorial Square in Charlestown, Mrs. Brandy-Williams noted that the programme was a collaboration between the Ministries of Social Development and Finance and the Nevis Bus Association. 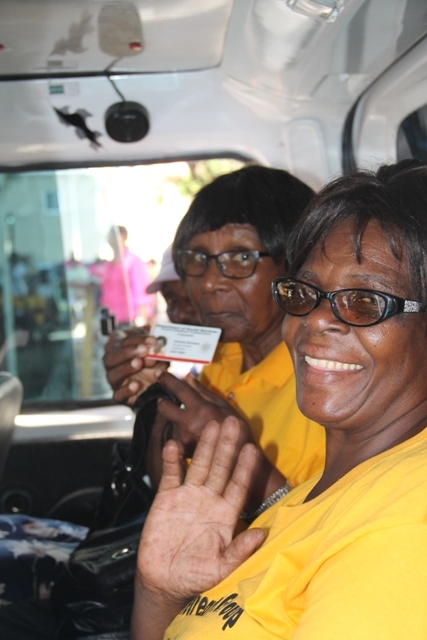 She said the Programme is open to all seniors 65 years and older who utilize public buses from the association and their identification card, issued by the Department of Social Services, which would allow them to travel at no cost to them. The Junior Minister said the initiative was another move by the Nevis Island Administration (NIA) to make life comfortable for the island’s seniors. “Again this administration is alleviating some of the stresses we recognize that seniors experience. “I also wish to inform that not only will this card allow you to travel on the buses for free, it also exempts you seniors from the $1.00 travel tax between St. Kitts and Nevis. This service is also extended to persons with disabilities,” she said. 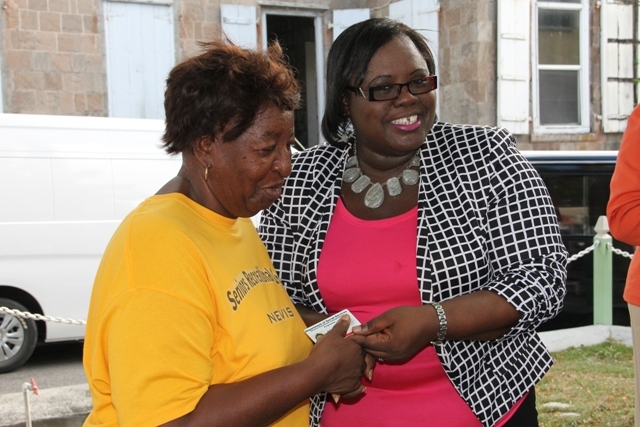 According to Mrs. Brandy-Williams, the Ministry and Department of Social Services strongly believe in the independence of the people of Nevis and more so the senior population, many of whom live on their own and are capable of providing self-care. She urged those who had not signed up for the programme but are interested to visit the Department of Social Services Seniors Division to register. However, the Junior Minister said the programme was not done in isolation. She explained that when the administration took office in 2013, it immediately put in place a long-term priority plan of action that would ensure that life and living for the elderly is comfortable. The weekly recreation programmes were expanded and a subsidized water and electricity programme to all seniors 65 years and older who meet the qualifying criteria was introduced. Those seniors are exempted in the amount of $30 on water and $150 on electricity on a monthly basis. Minister Brandy-Williams expressed satisfaction with the programmes. She said there were more than 275 seniors’ households with an average payment on their behalf to the Nevis Electricity Company Ltd. (NEVLEC) of $25,000 monthly. “Feedback from the seniors to this programme has been very positive, as many have indicated that they do not have to pay any bills now and are able to enjoy a better standard of living, as a huge relief has been extended to them,” she said. 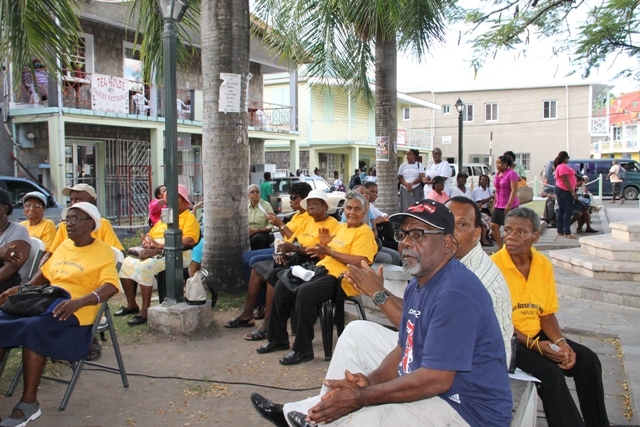 In 2014, the Ministry also launched a Sports Health and Wellness (SHAW) Programme which provides physical therapy to the housebound, many of whom are seniors. Through the collaboration of family members, weekly massages are provided by trained staff to those who are not fully mobile in their homes at no cost to them. Other remarks came from Permanent Secretary in the Ministry of Social Development Keith Glasgow, Coordinator of the Seniors Division Garcia Hendrickson, Public Relations Officer of the Nevis Bus Association Charles “Junie” Liburd and Acting Director of the Seniors Divison Kim Singh served as chairperson.